If your behind on this series, I would recommend catching up. The last page of issue #3 must be seen, but not mentioned. To the heart of the matter, this is a chase story. Glory and little Isabelle are running to get away from Korean Joe and the Dutch twins. One twin is blind and one is mute. Their little itty bitty back story is terrifying. It also shows that Joe had some awful beginnings. The book allows our hero to make it to a car. This is where the real chase begins. Pablo becomes attached to the car in a most peculiar way. His basic fear for his life is thrilling. Of course there’s a Mexican cartel to keep things interesting as well. 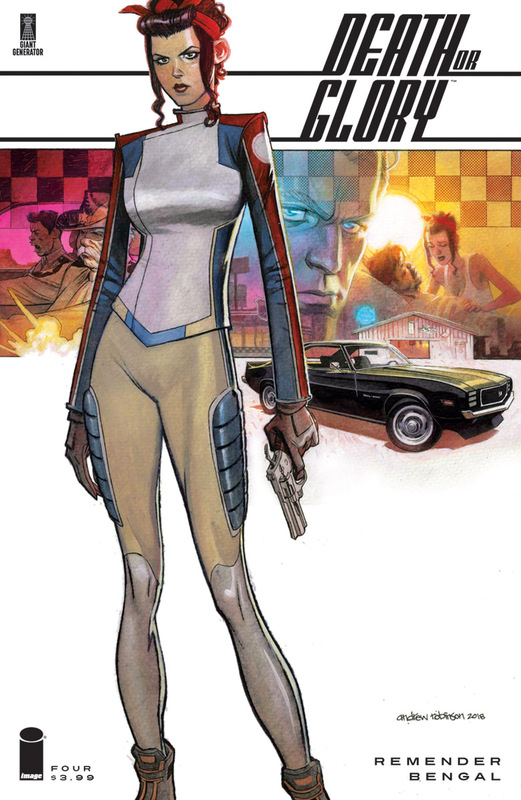 Rick Remender has created a story that is non-stop and action packed back to front. Bengal illustrated some much dark scenes then the previous issues. His detailed work didn’t show through as much, but it’s still fun to watch everything unfold. The book, again, ends with a cliffhanger that still puts Glory on the hook. It also gets us excited for the next issue.